As a battle-hardened commuter with thousands of miles under my belt, it’s not often you’ll find me paying compliments to a train company, but here I am. We realise that the landslip at Oxted caused extensive disruption to your journeys, although we did our utmost to provide the best service possible in the circumstances. Network Rail worked hard to rebuild the embankment so that we could restore a full service to the Uckfield and East Grinstead lines. 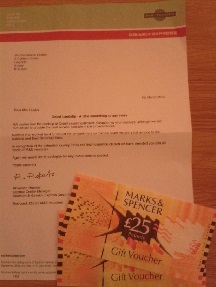 In recognition of the extended journey times and inconvenience caused we have awarded you £50.00 worth of M&S vouchers. Again we would like to apologise for any inconvenience caused. The Southern letter isn’t perfect, but it’s not bad. This entry was posted in Uncategorized and tagged apology, compensation, customer engagement, customer satisfaction. Bookmark the permalink. Ah, your DL days are long behind you, never compensate the customer unless you really have to ! Any other reasons in this scenario?